In the past four decades, millions of American women have entered the workforce, sought out new occupations, and embarked on professional careers. In fact, by 2013, just 18 percent of working women worked only part time. This marks a sharp reversal of conditions in 1975, when men did the vast majority of full-time work, while women were less likely to be employed at all and nearly a quarter worked 20-hours per week or less. These gains in gender equality are threatened by two provisions of the Affordable Care Act (ACA) ironically advertised as benefitting American workers. Taken together, these policies could drive the percentage of women working only part time back to what it was 40 years ago. The first provision is the ACA's penalty on large employers who do not offer health insurance to their full-time employees, beginning next year and going into full effect in 2016. The second relates to the eligibility rules for the law's new health insurance assistance that began this year. The ACA imposes a penalty on large employers (generally those with 50 or more workers) who fail to provide health insurance for each of their full-time employees-defined by the ACA as those working 30 hours a week or more. Because part-time employees do not count toward the penalty, the provision induces employers to reduce more of their workers to 29 hours a week or less-a group now being referred to as the "29ers." Compounding this effect is a disincentive on the employees themselves. The penalty does not apply to businesses that offer coverage to their full-time employees. But their full-time employees are finding that they are not eligible for the ACA's new assistance with insurance premiums and deductibles because the law requires them to join their employer's plan (or a plan offered by a family member's employer). Part-time employees are not restricted in this way, except in the increasingly rare instances that they too are offered coverage by their employer. As a result of its exclusive access to the law's new health insurance assistance, part-time employment becomes comparatively more desirable to workers, or at least less undesirable, than it was in the past. Both of these employment disincentives are worth thousands of dollars per year and, in some cases, more than a thousand dollars per month. Both will lead to less full-time work, and even less productivity per hour of work that is performed. This is because some positions are vastly more efficient when worked full-time, and the new employment disincentives will not be enough to change that. Nevertheless, a number of positions have traditionally been 30-to-39-hour jobs, and those who occupy these jobs typically will have less trouble adapting to a 29-hour schedule that avoids the employer penalty or allows the worker to get the ACA's new assistance. Women are at least twice as likely as men to be in those positions, which means they are twice as likely to be 29ers once the new health law goes into full effect. Some defenders of the ACA may contend these factors will relieve many workers of the "job lock" previously associated with employer-provided health coverage, or the need to tolerate the drudgery of long hours just to keep their insurance. They may claim women are "voluntarily" leaving full-time positions to spend more time with their families, or even to pursue art, music, and other hobbies. Their theory would make some sense if workers who left full-time employment were paying the entire cost of their decisions, but what's really happening is that taxpayers are bribing them to work less. Both female and male 29ers will be making the best of a bad situation created by public policies that take away much of the financial reward from working full time. To make matters worse, the new 29ers will be creating additional burdens for other taxpayers as the 29ers receive more non-ACA subsidies and pay less in taxes than they would as full-time workers. These new ACA employment disincentives are just two among many factors determining the kinds of work schedules that employers offer and employees accept. Regrettably, they are likely to have the unintended consequence of turning back the clock on decades of progress women have made in the American labor market. Casey B. Mulligan is an economics professor at the University of Chicago and author of a new working paper published by the Mercatus Center at George Mason University on "The Affordable Care Act and the New Economics of Part-Time Work." He is also the author of "Side Effects: The Economic Consequences of the Health Reform." The labor market really jumped in September. Part of this is rounding error on weekly hours, which went to 34.6 after six consecutive months at 34.5 (the jump from 34.4 to 34.5 can be seen by comparing January and March of this year. 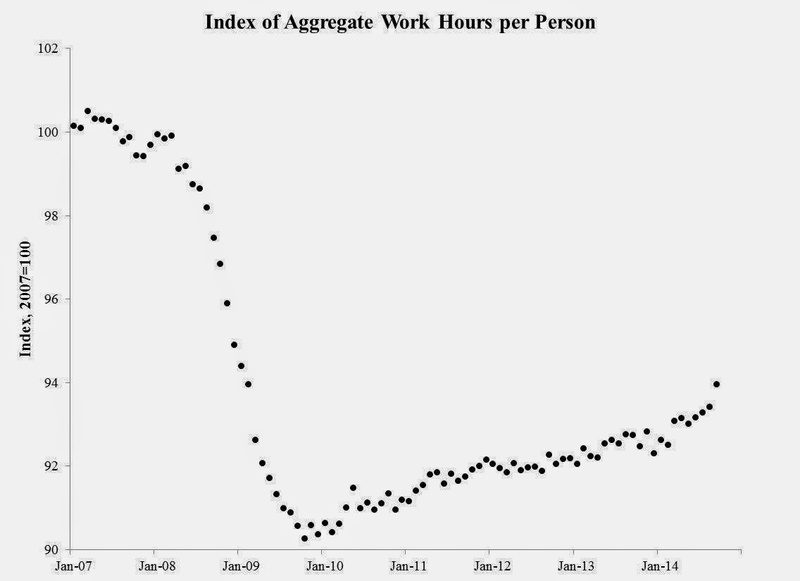 In Jan of this year average weekly hours jumped from 34.3 to 34.4). But it is still surprising because the jump is more than twice the amount created by rounding error.